Sprint Series automatic Hot Foil overprinters | PAK Automation Ltd. The Sprint Series are easy to use, automatic Hot Foil overprinters. They are cost effective yet manufactured to very high standards. Three models are available. 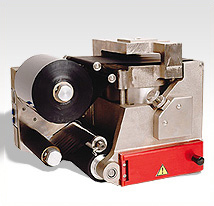 The ‘Sprint’ has a print area of 60 x 25mm and is ideally suited to date and batch coding. The ‘Sprint Major’ offers a print area of 100 x 50mm and the ‘Sprint 100’ offers 100 x 100mm. These larger units and can be used for simple graphics/text or for spanning over more than one label or pack. The Sprint series of Hot Foil overprinters are comparatively small for their print capabilities allowing simple installation on to any reel fed packaging or labelling machinery in conjunction with either standard, or custom designed mounting frames.